Western blot analysis of extracts from mouse lung and Hep G2 cells using ADH1 Antibody. 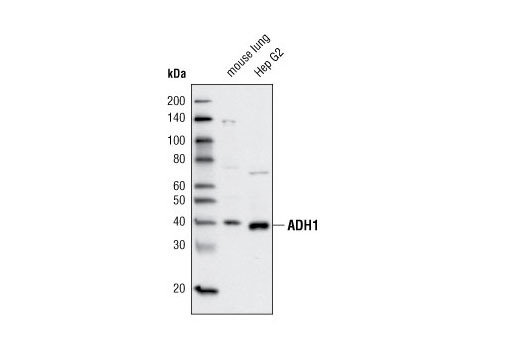 ADH1 Antibody detects endogenous levels of total ADH1 protein. The antigen is 100% conserved between human ADH1A, ADH1B and ADH1C proteins. Polyclonal antibodies are produced by immunizing animals with a synthetic peptide corresponding to residues surrounding Val74 of human ADH1B protein. Antibodies are purified by protein A and peptide affinity chromatography. Human alcohol dehydrogenase (ADH) genes are grouped into five classes, with three distinct class I ADH genes (ADH1A, ADH1B and ADH1C) and ADH4, ADH5, ADH7 and ADH6 belonging to classes II, III, IV, and V, respectively. ADH is a zinc-containing, dimeric enzyme that catalyzes the conversion of cytosolic alcohol to acetaldehyde in the liver with the coenzyme NAD (1). ADH1A is monomorphic and is the predominant fetal and neonatal liver ADH enzyme. In contrast, polymorphic ADH1B and ADH1C enzymes are predominant in adult livers (2). Polymorphisms in the human class I ADH genes result in functionally variable ADH enzymes; evidence suggests that specific variants may provide protection from the risk of alcoholism (3). Edenberg, H.J. (2000) Prog Nucleic Acid Res Mol Biol 64, 295-341. Su, J.S. et al. (2006) J Biol Chem 281, 19809-21. Chen, C.C. et al. (1999) Am J Hum Genet 65, 795-807.